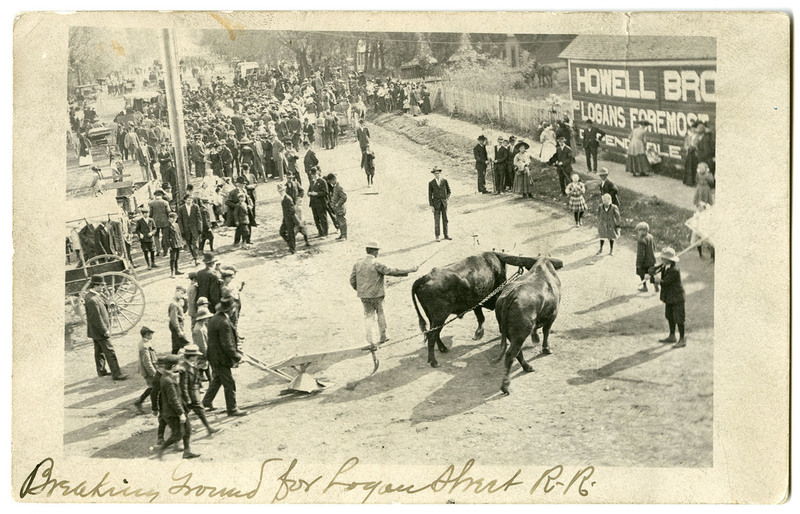 Photo labeled "Breaking Ground for Logan Short R.R." Crowd gathered, Utah-Idaho Central Railroad. Advertisement for Howell Brothers on side of station. Postcard addressed to Dr Emmit Browning. Back of postcard reads, "Dear Doctor. Howdy. All's well and busy. Hope you are. Jane sends love to you. Drop us a line and let us know how you are. S.B. Thatcher." Logan, Utah. “Crowd gathered for the groundbreaking of Utah-Idaho Central Railroad,” USU Digital Exhibits, accessed April 24, 2019, http://exhibits.usu.edu/items/show/19709.